We bet that one place you never imagined yourself being is in the middle of a house filled with foxes. This is exactly the setup you’ll find in the Foxin’ Wins A Very Foxin’ Christmas slot by NextGen. It’s a 5 reel, 25 win line slot playable from as low as 25p per spin. This Foxin slot has a Christmas theme with the chance to win free spins, random cash prizes,multipliers, a SuperBet feature etc. You can access the game on your desktop and all mobile devices. NextGen Gaming licenses its slot games to online gambling software platforms to help in distributing its games to larger audiences. NextGen games are available on platforms like Bally, Ash, Aristocrat, etc. This is a clever tactic to improve their reach, but it has a slight downside. Firstly, players never really know if they are playing a NextGen game while on those other platforms. Secondly, their games feature as background slots because they have lower quality graphics, audio components, etc. The slot has an obvious festive feel to it which means it will definitely get you in the Christmas mood or will have you craving the holidays. A cheerful soundtrack in the background accompanies the action as you journey into the foxes’ beautiful home with theirbeautiful Christmas tree lit up. Symbols on the reels include the classic playing cardsA, K, Q, J, 10 and 9 which have been remodeled to look veryfestive. Other symbols include;Christmas trees, the Foxin’s sports cars,wads of cash, a gingerbread house and snow globes.The sport cars have the highest normal payouts of up to 1,000 coins if you land 5 in a row. Wild symbol- The Fox wearing a Christmas hat is the wild icon. It canreplace all the other symbols except the scatter. It is the highest paying symbolwhich gives 80x your stake for 5 on a win line. The Fox Pup symbol can appear on a reel and turn a symbol wild. This occurs frequently during the free spins. Random Bonus- This feature is randomly activated in the base game. One of two options i.e.Leprechaun Shakedown or Fox Funds will occur and give you a random cash reward. Scatter symbol- The golden pot is thescatter symbol. When 3 or more appear, they reward 10 free spins. Free games- All wins in the free spins bonus come with a double multiplier. 3 or more scatters can retriggermore free spins raising your total to 20. Wilds appear more frequently during free spins. 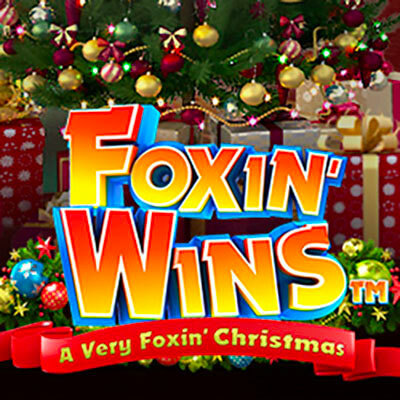 Foxin’ Wins A Very Foxin’ Christmas brings in that Christmas cheer with its colourful and fun theme.Payouts can go up to 2,000x your bet on every free spin. The Fox Pup appearing frequently means more festive wins for you. Try your chances with the 2nd option in the SuperBet feature i.e. Level 2 because it can appear on all the reels.